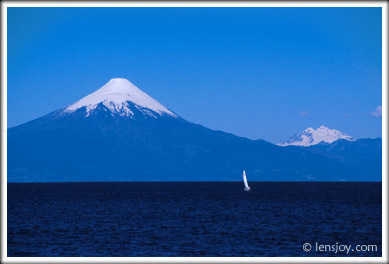 This photo of Volcan Osorno, a well-known Chilean landmark, was taken at Lago Llanquihue in the central lake district town of Frutillar. It was a fine summer day and our group had rented a car to drive to Argentina for a short trip. We stopped at this deep blue lake and most of the parking spaces were taken. There were some children that would stand in empty spaces and ask tourists for a dollar to give up the space. I gave a dollar to one of them, and suddenly his friend showed up and asked for another. In my best Spanish I told him one dollar was enough and to split it with his friend! It seemed that all of Chile was out to enjoy the beach that day. Besides all the interesting people, there was a stunning view of this famous conical volcano, closely resembling Japan's Mount Fuji. The sailboat just happened to be in the perfect place to add balance and interest to the composition.